Howdy, folks, Uncle Geekly’s back with another group of starter board games. For those of you who are new to the site, our starter game series takes a common or popular game mechanism and picks some good games that feature that mechanism but are easy to learn. Many of these games on these lists will start easy and work their way to greater complexity. In today’s list we’ll cover pick-up and delivery games, and this mechanism works like its name suggests: players will pick up items from one place and deliver them to another. It’s a simple mechanism that finds its way to several great games, but there are two issues that came up when compiling this list of starter games. First, many designers don’t believe in having a straight pick-up and delivery game (it’s too boring), so you won’t find too many games with pick-up and delivery as the only mechanism and only a handful more that will include pick-up and delivery in a group of two or three mechanisms. The second is that by adding extra game mechanisms, designers make many pick-up and delivery games more complicated, so there will be games like Firefly and Freedom: The Underground Railroad that are excellent pick-up and delivery games (a couple of my favorites) but slightly more complex than a starter game should be for newcomers. Enough about the games that won’t be on this list. Let’s talk about the ones that made the cut. We start with the simplest game of the lot, Deep Sea Adventure. Sure, this game has a push your luck element and uses roll/spin and move, but it’s the closest game to pure pick-up and delivery. Players assume the roles of deep-sea divers. There are four levels of treasure (tokens) with a number (points one can score) printed on the front and the level denoted in dots on the back. The tokens get shuffled and placed in a wavy line protruding from the submarine (where the players pawns start), going from level 1 to level 4. Players take turns diving into the sea (by rolling two specialty dice numbered from 1-3) and try to go as far as they can, but beware. All players share the same oxygen tank and when the oxygen level reaches zero, the round is over and only those who returned to the submarine with treasure in hand score points that round. Deep Sea Adventure is charming. It doesn’t look like it would have much strategy, but it’s a lot deeper (pun intended) than first glance. Do you push your luck and go deeper, or do you turn back around with the treasure or two you picked up early on, so you know you’re scoring that round? There’s even a built-in catch-up mechanism where the higher scoring tiles are easier to get to in future rounds, so players who are behind early in the game can score a heap of points in round two or three. I’ve even considered picking up as many level one and two treasures as I can in the first round and since those lost treasure tokens get added to the end of the treasure path in stacks of three, I can claim them later in the game for big points. Like I said, there are plenty of play styles and stratagems for this easy-to-learn game. Deep Sea Adventure may be marketed toward kids (if you don’t believe me, check out this adorable how to play video by Oink Games) but there’s enough going on to interest adults. You can find Deep Sea Adventure at most Barnes and Nobles but be on the look out for a small package. Oink Games come in small boxes and while I haven’t played all the Oink Game titles, most of the ones I’ve played are at least baseline good. I know that I said this before, but pick-up and delivery games have a knack of being very complicated. Case in point, My Little Scythe is a simplified, or child-friendly, version of Scythe, which happens to be on a lot of people’s best games of all time, but the original Scythe is far too complex for a starter pick-up and delivery game list. Heck. My Little Scythe makes the list by a skosh. My Little Scythe was designed by a father and daughter, so that the father could play his favorite game with his young daughter, and it follows various animals of the animal kingdom as they prepare for the harvest festival. Players take turns earning trophies by earning specific accomplishments. There’s a lot going on in this game, but no single game mechanism is that complex. That said, I won’t spend too much time with how to play My Little Scythe because this isn’t a “how to play” write-up, it’s a starter game write-up. If you’d like detailed rules explanations, check out Rodney Smith’s video at Watch It Played; Rodney does excellent work. For now, let’s focus on what makes My Little Scythe a good pick-up and delivery starter game. My Little Scythe takes an interesting look at pick-up and delivery. There’s a strong worker placement element to it—so it would make a nice addition to starter worker placement games—but two of the four trophies needed to trigger the end game (the harvest festival) requires players to pick up four of one kind of resource and drop them off at the castle (centrally located on the board). At least four of the remaining possible six trophies players can earn can be achieved by picking up resources and controlling them. In My Little Scythe, players are considered to have control of resources if their pawns occupy the same space as a resource. If the player controls the resource, they may spend it for other items. That’s a clever distinction that doesn’t show up in any of the other games on this list. So, I guess one could consider My Little Scythe a pick-up and control game. There are so many other elements going on with My Little Scythe that I won’t mention the rest of them here, but each element works well and the whole is an easy game to learn and teach others. I wanted to include it here because of the interesting twist My Little Scythe makes with the pick-up and delivery mechanism. I know that it’s following Scythe’s lead, but we need more games that add wrinkles to well-established game mechanisms. Forbidden Desert seems to make it on a lot of these lists, but it does fit the pick-up and delivery mechanism requirement and it’s a darn good game, perhaps the best of the Forbidden series, but that’s because I haven’t had the chance of playing Forbidden Sky as of this write-up. In Forbidden Desert players are stranded in an inhospitable desert. They must find and collect (or pick-up) the parts to a flying contraption and deliver the completed machine to the launch pad, so they can escape. It’s been six years since Forbidden Desert’s initial release, and I still marvel at the way shifting sand is represented by drawing desert cards, shifting land tiles in the direction the cards command, and placing sand tokens atop the land tiles that moved that turn. It feels right. It plays like an unpredictable desert storm. The way players must uncover both a vertical and horizontal tile for each object to reveal which tile one of the parts resides is brilliant; no game plays the same way twice. This also adds to the storm’s unpredictable nature and the fact that players can get buried in sand adds to the atmosphere of being lost. If the tile your pawn stands on moves, your pawn moves too, and board’s state may be far different from the end of one of your turns to the beginning of your next. Again, this adds to the players’ feeling of hopelessness—at times—or they may find the board moves in their favor and that’s wonderful. I’ve said it before, but it remains true, Forbidden Desert is an excellent game. It also happens to be an excellent pick-up and delivery starter game. Pick-up and delivery may not play as big of a role in the turn to turn aspects of Forbidden Desert, but the only way players can win this game is by picking up and delivering the flying contraption to the launch pad. Hopefully, we’ve covered some games you either haven’t played or haven’t considered pick-up and delivery games. Uncle Geekly tried to go with a mix of games that use predominantly pick-up and delivery (Deep Sea Adventure), implement pick-up and delivery as the only way to win but doesn’t include it with the turn to turn action (Forbidden Desert), and found one that provides a twist to a popular mechanism (My Little Scythe). Know of any other great beginner pick-up and delivery games? You can deliver your questions, complaints, and suggestions in the comments. Let’s talk about cooperative board games—cause you’ve gotta have friends. These are games where the players compete against the game, not the other players seated at the table. It also happens to be one of your uncle Geekly’s family’s favorite gaming types. That could be due to a lineage of sore losers. They’re sore losers, not me. No, really. They’re terrible. I have no idea what you’re talking about. No, you’re a stupid, doodoo face, and I don’t want to play with you anymore because you cheat. Cheater! You don’t have to worry about cheaters as much with cooperative board games, and there are plenty of these games out there. The problem is that some of these games aren’t that good and others are too difficult to get into. Don’t worry. Your uncle Geekly will point you in the right direction of some good beginner cooperative board games. I almost didn’t put this one on the list, but I’m sure tabletop game purists would cry foul if I didn’t. You made a list of great starter cooperative games and you didn’t include Pandemic? Shame! Calm down. It’s on the list. Players assume the roles of people trying to stop a global pandemic. The diseases behave like you’d think diseases may behave and that makes sense, since the game’s designer Matt Leacock happens to be a medical doctor. Come to think of it, I could use a physical. There’s a growth I’ve been meaning to have examined. I should give him a call. Anyway. The game scales extremely well, meaning that it plays just as well at two players as it does at five, and there are varying levels of difficulty. You’ll see this in other Leacock games—spoiler alert: one will show up later on this list—and the inclusion of easier difficulties allows players to start small and go for something more challenging later. The theme is also one people can get behind. I don’t know how many times I’ve seen players name the various diseases, even though these diseases are represented by little more than cubes. The one gripe I may have about Pandemic is that there can be a tendency for an alpha gamer (a player who tells other players what to do) but give them a few kicks to the cubes and they’ll stop. Pandemic is one of the games that put cooperative games on the map, and it’s easy enough to learn for new gamers. Hanabi is the odd game on this list. It’s a simple card game for folks who don’t want a more complicated game, so it’s easily the most streamlined game here. It also encourages non-verbal communication. It’s like Freddie Mercury once said, give me your body. Well, maybe not, but body language and positioning cards a certain way in your hand does come into play here. Hanabi uses a deck of cards numbered 1 through 5 in various colors or suits. Players must place these cards in order by suit, but the catch is that each player’s hand of cards is facing away from them, and the other players must give their teammates clues as to what’s in their hand. Hanabi forces players to create their own language as they’re only able to give simple clues like “this is a 5” or “this card is yellow.” It’s up to the player receiving the information to figure out what was intended. While “this card is a 5” usually means don’t discard it, idiot, because there’s only one 5 of each color in the deck, “this card is yellow” could mean that the card in question plays on the communal play pile or if yellow is already finished (as in the 5 has already been played), “these cards are yellow” could mean that you need to discard those cards and get new ones. No one can say anything besides short clues about cards in other players hands. I’ve never seen a more tense game where little is said. Yep, Forbidden Desert is the other Matt Leacock game. I also could’ve gone with Forbidden Island here, but it’s kind of a Pandemic light. Forbidden Island is worth the play if Pandemic or Forbidden Desert sound too complicated. Did I mention that Matt Leacock is the king of cooperative board games? Well, if he isn’t, he’s close. Forbidden Desert adds moving location tiles and sand tiles to bring home the theme of a desert and its shifting sands. Players can lose four or five ways but can only win if they find the parts to an ancient, Jules Verne style flying contraption and escape. Anything is better when you add a steam punk. Players also have variable powers like they do in Pandemic and these powers are based on occupation, and the flying contraption is one of the best implementations of a toy piece in a board game. I don’t know the last time I placed one of the pieces in the flying contraption. I usually have the task of dismantling. Your uncle Geekly’s a little salty about that. Like Pandemic, Forbidden Desert is clever and finds a way to make the desert its own character. That’s always a strong point for a game. I can’t wait to see what Leacock’s third game in the trilogy Forbidden Sky will bring. It just came out at GenCon 2018. Even if a cooperative game is more complicated than the ones on this list, it’s easy to teach new players because players join forces to beat the game. Players want their teammates to succeed so a cooperative game is a great place to begin for a new gamer, but the games on this list are very assessible. If you don’t think so, I’ll dump a bucket of cold water on Jim. Know of any other great beginner cooperative games? Let us know in the comments. We’ve received a couple of questions about Forbidden Desert’s Terrascope equipment card, and at the risk of incurring Game Zeus’s wrath, we’ll answer your questions. 1) Does a desert tile need to be devoid of sand markers on top of it in order to peek at the tile? A) No. The great thing about the Terrascope is that you can figure out where you need to go and whether ridding the desert tile of sand markers and excavating it is worthwhile. 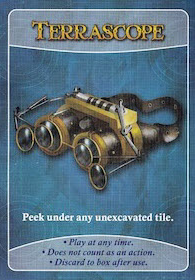 2) Do you need to excavate the desert tile you used the Terrascope on? A) No. Think of the Terrascope as getting a sneak peek of the desert tile without the mess of having to excavate the tile. Now if the tile in question is one you want to excavate after seeing it, feel free to clear the tile of sand markers and excavate it. But the helpful Terrascope can let you narrow the number of tiles you need to worry about. And time is a valuable commodity in Forbidden Desert. It might be the single most important commodity. We welcome any other questions about other tabletop games you may have and if you haven’t seen our review of Forbidden Desert, here’s a link. Hope your 2015 is off to a fantastic start.